There are eight species of bats in Ontario and Quebec and six species in Manitoba. These species are divided into two groups: non-migratory bats, which spend the winter in Canada in mines or caves, and the migratory bats, which spend the winter further south, but return to Canada in the summer. The migratory bats include the red bat, the hoary bat and the silver-haired bat. These species spend most of their time in open areas, such as forests found near lakes, rivers, ponds and clearings. Because of this, they have longer wings, which give them better lift during flight. They are easily identified by their characteristic coat colours. Migratory bats primarily roost in trees, but they can occasionally be found in buildings during the summer. 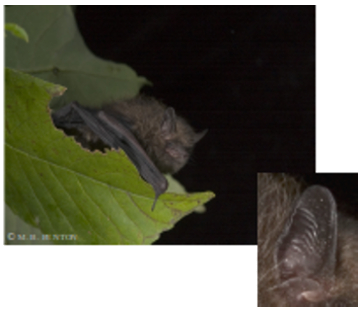 So far, there have not been any cases of white-nose syndrome recorded in these three bat species. External characteristics : The male has a red-orange coat, while the female has one that is a mixture of yellow and maroon. Fur colour is a distinguishing characteristic of this species. Hair on the back, chest and shoulders is white, and individuals have a white patch under their chin. The uropatagium of the Eastern red bat is covered with thick fur. Their ears are hairy, round and lack a black border (in contrast to hoary bats). The tragus is short and wide. The red bat has long, thin wings that are covered by hair all the way to the wrist. In general, the males are more colourful than the females. Red bats migrate in the fall towards the central and southern United States, and even as far as Mexico. In Quebec, they live in coniferous forests as well as mixed forests. They prefer to roost near the tops of trees. Suspended from the branches, they can easily be mistaken for dead leaves or pinecones. When hunting, they can be found flying close to sources of water, fields, or urban areas. Mating occurs in flight as the bats are migrating south in the fall. Litters of 1-4 pups are born each year, but typically there are only 2 offspring born to each female. The gestation period is between 80 and 90 days and the young are born between May and July. External characteristics : This is the largest species of bat in Canada. They have a light brown coat and individual hairs are ash-coloured at their tips. The hair around the face and chin is yellow, and this can help distinguish them from other species. Hoary bats’ ears are short and rounded with a well-defined black line bordering them. The tragus is short, round and wide. The back of the uropatagium and feet are covered by dense hair. In the fall, individuals migrate to the southern United States and the Carribean. There, they roost in crevasses between rocks or in squirrels’ nests. In Canada, hoary bats live in coniferous or deciduous forests. They roost near the tops of trees and hunt in clearings near sources of water. The males and the females migrate together. It is not clear whether mating takes place before, during or after the southern migration. The female gives birth to, on average, two offspring, but she can have as many as four each year. Females give birth in the horizontal position and use the uropatagium to catch the pups. External characteristics : The coat is black or dark brown and the tips of the individual hairs on the back are silver. The coat covers the upper portion of the wings and about a third of the uropatagium. The ears are almost as long as they are wide. They are black at the base with a pink interior. The tragus is short, straight and rounded at the end. Silver-haired bats have a slow flight, which distinguishes them from other species. In the fall, the silver-haired bat migrates to South Carolina. 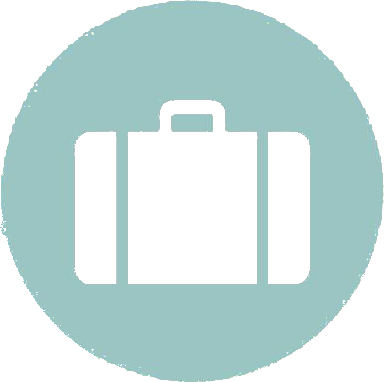 During this period, they can be found in buildings. If not, they prefer to make their homes in forested regions near water where they have access to abundant sources of food. They roost near the tops of trees, under the bark or in holes made by woodpeckers. There is very little information on the reproduction of this species. It is thought that mating takes place in the fall. They have litters of two pups per year and the young are born in June or July. The silver-haired bat is solitary, but it can form small groups of three or four individuals when roosting or hunting. The non-migratory bat species are: the little brown bat, the Northern long-eared bat, the Eastern small-footed bat (not found in Manitoba), the big brown bat and the Tri-coloured bat (not found in Manitoba). Compared to the other three species, their short and rounded wings give them better manoeuvrability. 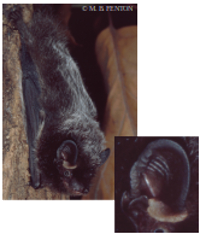 Therefore, non-migratory bats are often found in closed environments (coniferous forests, urban areas). Resident bats spend the winter hibernating in a hibernacula. These sites may be found in abandoned mines or natural caves. Consequently, these species of bats may also be called “cave-dwelling bats.” During the winter, these bats reduce their body temperature to around 3ºC to 6ºC in order to minimize energy costs, given the lack of food during this period. A site only makes a good hibernacula if it provides an environment in which this temperature can be maintained. The five cave-dwelling bat species are affected by a fungal infection. This disease is called white-nose syndrome (WNS). This infection develops exclusively in hibernacula during winter and affects bats by increasing the number of times they wake up. During the summer, some cave-dwelling species use buildings to give birth and raise their young. They can also roost inside holes in live or dead trees, or under tree bark. 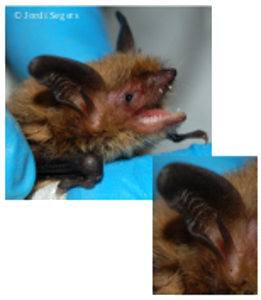 External characteristics : The Northern long-eared bat resembles the little brown bat. The hair on the back and ears of the Northern long-eared bat are dark brown, while the fur on the stomach is a paler yellow-brown colour. 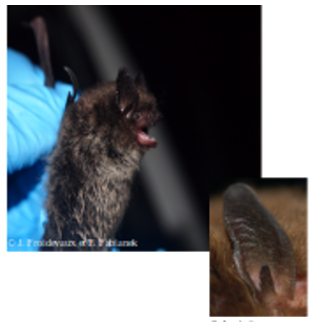 This bat has very long ears with a thin tragus that is pointy at the tip. This is one way to distinguish it from the little brown bat, which has a tragus that is short and rounded. 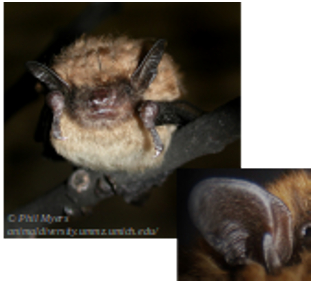 The wings and tail of this species are larger than those of the majority of the members of the genus Myotis. This species prefers to live in boreal forests and tends to be solitary. Between the end of August and the end of May, small groups of this species hibernate in caves, rock crevasses or occasionally underneath the bark of trees. Individuals choose hibernation sites where the temperature is cooler than those sites chosen by the tri-coloured bat and the little brown bat. Mating occurs in the fall before bats enter hibernation. Sperm is stored in the body of the female throughout the winter and fertilization occurs in the spring. Gestation lasts between 50 and 60 days. The Northern long-eared bat has only one pup each year. They are born in either June or July. External characteristics : This is the second largest species present in central Canada after the Hoary bat. Their coats are composed of many colours. They are typically dark brown on the back and paler on the stomach and their fur has an oily sheen. The face, ears, wings and tail are black and have a leathery appearance. The ears and the tragus are rounded. The females of this species are larger than the males. This bat is found in a large diversity of habitats, from wooded regions near water sources to urban areas. Most bats need a stable environment in which to hibernate, but the big brown bat has a high tolerance for a wide range of environmental conditions in hibernation. In fact, compared to other species, the big brown bat can tolerate hibernating in roosts that are colder, drier and more exposed to air currents. It is for this reason that big brown bats are the species most likely to be found in human dwellings in the winter. Mating occurs in the fall or winter. Sperm is stored in the body of the female during winter and fertilization occurs in the spring. Between mid-May and the end of June, females regroup in maternity colonies to give birth to young. Females will give birth to litters of one or two pups each year. External characteristics : This bat resembles the Northern long-eared bat. The fur colour is variable, ranging from olive brown, to dark brown, to almost black. The hair of this bat appears shiny and is darker at the base than at the tip. You can identify this bat by several long hairs that extend from the feet to the claws or sometimes even further. 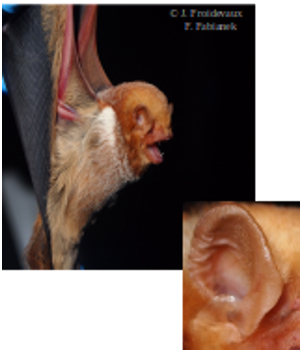 This bat has a rounded tragus that extends half the length of the ear. 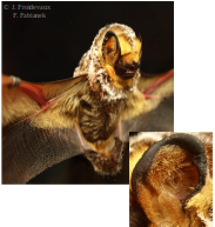 This differs from the tragus of the Northern long-eared bat, which has a longer ear and a tragus that is longer, thinner and pointier at the tip. Before the arrival of White nose syndrome, the little brown bat was the most common and widespread bat in Canada. For several years now, however, their populations have experienced a steep decline in eastern North America. The little brown bat can be found in a wide range of habitats, including forested regions close to sources of water as well as urban areas. Mating occurs in fall, and sperm is stored in the body of the female throughout the winter. Fertilization occurs in the spring. Gestation lasts between 50 and 60 days and the young are born between May and July. Female little brown bats give birth to just one pup each year. Females return to the same maternity colony site each year. External characteristics : This species is the smallest bat found in Canada, and is also the most rare. Their coat is golden brown on their back, but the hairs are black at the base. The coat on the stomach is a greyish brown. The face and the ears are completely black, and the ears are moderately long with a pointed tragus. This species can be identified by its very small feet that are no longer than 8 millimetres. The Eastern small-footed bat is found in mountainous forests. It can tolerate colder temperatures than the little brown bat. 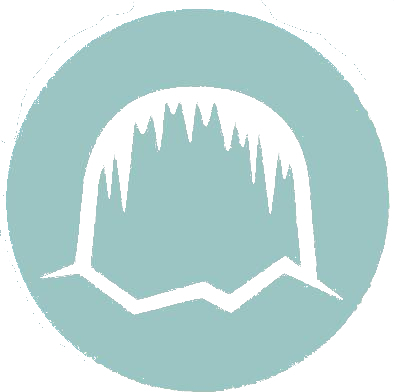 Individuals spread out to hibernate in crevasses, caves, or inside abandoned mines. They hibernate in a horizontal position, close to the entrances of caves, where temperature and humidity is more variable, and isolate themselves from other individuals. Mating occurs at swarming sites in the fall and males and females have many partners. The Eastern small-footed bat has one pup each year that is born in July. At birth, pups weigh an estimated 1-2 grams, which is about 25-30% of its mother’s weight. External characteristics : Coat colour is a distinguishing characteristic of this species. Individual hairs are tri-coloured: grey at the bottom, yellow in the centre and dark brown at the tip. The back and the stomach are the same colour. This species has black wings and a face that lacks hair. They have large ears with a short, straight tragus. In this species, females are larger than males. The tri-coloured bat can be found near the edges of forests or flying near sources of water. Beginning in October, this species hibernates in caves or abandoned mines, either in small groups or alone. Mating occurs in the fall prior to hibernation. The tri-coloured bat typically gives birth to a litter of two pups. The young are born between the end of May and beginning of July after a gestation period lasting 44 days. At birth, the pups weigh 1.9 grams, about a quarter of the weight of their mother. To know the provincial status of each species, visit http://www.natureserve.org/, enter the latin name of the species in the search field and look under the conservation status tab.